Trinity Love Jones' body was discovered in a black duffel bag on March 5 by maintenance workers in Hacienda Heights, about 20 miles east of downtown Los Angeles. The mother of a 9-year-old girl, whose body was found inside a duffel bag near a Los Angeles-area hiking trail, has been charged with one count of murder, the district attorney's office said. 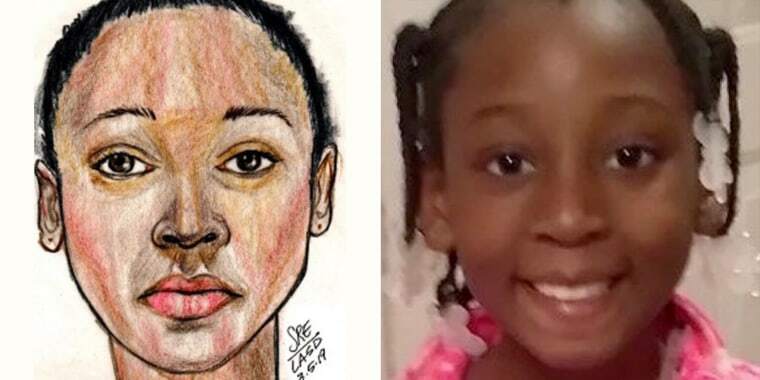 Taquesta Graham, who was arrested earlier this month in Texas on an unrelated charge and extradited back to California, was booked Monday in connection with the murder of her daughter, Trinity Love Jones, according to the Los Angeles County Sheriff's Department. Graham is expected to be arraigned in the Los Angeles County Superior Court on Wednesday afternoon, the Los Angeles County District Attorney's Office said. If convicted, she faces a maximum sentence of 26 years to life in state prison. Trinity's body was discovered in a black rolling duffel bag March 5 by maintenance workers in Hacienda Heights, California, about 20 miles east of downtown Los Angeles. The sheriff's department said it appeared as though the duffel bag had been pushed down an embankment from Hacienda Boulevard. The child's death has been ruled a homicide, but authorities have not said exactly how she was killed. Graham, 28, and her boyfriend, Emiel Lamar Hunt, were stopped March 8 at a border patrol checkpoint in Hudspeth County, Texas. Graham was arrested for an unrelated parole violation and extradited back to California on Thursday. She is being held at a Los Angeles County Sheriff's station in Norwalk on a $2 million bail. Hunt, 38, was initially released by the authorities in Texas, but arrested again March 9 in San Diego after detectives learned that he and Graham were involved in Trinity's death. Hunt is being held at the Norwalk Sheriff’s station on a murder charge with bail also set at $2 million. He faces up to 55 years to life in prison if convicted of murder. Antonio Jones, who identified himself to NBC Los Angeles as Trinity's father, described the little girl as someone who was "full of character, full of love, full of joy." "We just want answers," he said. "We want justice."